Creativity is a natural talent in a person, sometimes even transferred genetically. Some people are just more creative work plan than others. It does not specifically depend on where they work or what background they come from. Creativity is an art, a skill, which makes things completely new. It is said that people who are more creative work plan are right-brained, i.e., they use the right side of their brain more, which is said to generate ideas and creative juices. Creativity is the key driver for any organization, big or small, towards successful attainment of its goals, retaining its market position, thereby increasing the customers and profits. Employees those are able to generate new ideas every now and then, be it at a desk, in a meeting, or even under pressure. Creativity comes from within. However, it’s important to keep your mind active, positive, and relaxed at the same time to generate continuous imagination. Creativity is the life-line to an organization. Not only for a designing industry, but any other industry needs creative ideas flowing regularly to thrive in the long-run. Creativity and imaginative thinking do not make constraint you from anything, unlike logic, which comes with its do’s and don’ts. A continuous flow of new and creative imaginations is a must to attract new customers and also maintain and retain the loyal ones. It is a regular fulfillment of customer’s changing needs and demand patterns that keep the business going. This keeps the customers brand loyal and spread a positive word-of-mouth in the market. Innovation is a joint effort of positive and balanced mind of the employee and healthy work environment at the workplace. To become the employee of the year is no cakewalk. It requires efforts and smart work to be the one who is considered most responsible, reliable and innovative of all. Following are the ways to make the more creative work plan, where it is most required. “A Healthy mind resides in a Healthy body”. The quote correctly explains that regular exercise and movement of the body lubricates the creative areas of the mind. It’s very important to keep the body moving. The blood flows in the body, generating the creative ideas and thoughts. Take out time and spend with nature and perform yoga, go for a walk in a park, or an early morning jogging and running session. The fresh air and a fresh environment will soothe the mind, throwing the tension away and making the mind and body relaxed. Working out or exercising is one of the great ways to get unstuck from a problem you’re facing. It is a good option to take a break, instead of getting stuck in a rut. This takes your mind off the issue and further improves your subconscious capability to resolve things. Be inspired and stay positive. Continuous inspiration to do the best helps you to make creative work plan and full of ideas. It builds and develops your imagination performance. Surround yourself with inspiration. Have a space on the wall of your study or desk where you can just display anything that captures your attention. It can be any new creative thing: an ad in a magazine, TV or social website, a sitting/standing arrangement in a bar, an amazingly designed office, or even a smallest of simple things differently done that crossed your mind. Remember: active is good but proactive is better! Majority of people say ‘No’ to anything that is out of their comfort zone. Reason being their awkwardness and closed mind towards changes. There are things that we can do with our eyes shut, but these also blind us to opportunities available every moment. Remember: Life begins at the end of your comfort zone. Being open to changes and new experiences gives us the courage to try something new ourselves, that is where a Creative mind is born. It’s very important to keep in mind: The only permanent thing is Change. Therefore, don’t be afraid of changes. The more flexible and dynamic you are the more efficient and reliable you will be at your workplace and elsewhere. Meditation, in simple words, is an art of concentrating. This clearly explains what meditation does to a human being. The workplace is where we need maximum creative and new ideas. A critical situation does not come with a warning or a signboard. The employees are expected to give new ideas at all times, be it in a meeting, at their work-desk, or a feedback session. Therefore, if your mind is focussed and you are able to concentrate on the work, you will be able to give out more ideas that are different from others, in a positive way. Meditating every day is an advice even suggested by famous business personalities. It helps you expand your focusing power and concentrating skills. This is a fantastic way to recharge your creative juices, as it clears your mind from everything and changes your focus for a little while. Hence, you are able to think more clearly and make creative work plan. Being ambitious might be good for your career, however, not in the long-run. You might want to dedicate all your time to your work, especially when you start working afresh. But remember, a relaxed mind and body can only produce efficient results. It is very important to take proper and complete sleep for 7 hours to work at your creative best. Sleeping with your problem is the last thought on your mind, sometimes solves the problem when you get up in the morning, as your brain keeps working on it. If you want to make more creative work plan and more innovative, the brain should be given an opportunity for its unconscious thought-process and get a good sleep at night. This is an activity that works wonders for any organization. Brainstorming is a team activity where employees are free to give out ideas without any fear of being judged or discouraged. It does not only encourages the employees to come up with new and creative ideas but also boosts their morale and confidence level, further helping the organization make a competitive edge in the industry. Written or oral, it is always good to discuss new ideas with the team or your boss, to get the ideas flowing. Mixing and matching of small ideas help an organization get a creative work plan result. Discouragement or insult can make an efficient employee unproductive. This harms the organization as well the employees’ mental health. Make sure brainstorming is done on a regular basis and in a healthy and positive manner. Sometimes, even a near-nonsensical idea can be improved and molded leaving no stone unturned. Networking is a great way to know people in and out your workplace. It helps you collect experiences, ideas, viewpoints, and approaches, resulting in a groomed personality. These different insights help you and your organizations assess the situation closely, and consequently, the ideas to improve and enhance the organization’s process flow in abundance. Working with the veterans or specialists is a whole new experience altogether. The priceless experience they have can prove immensely helpful. Not only the veterans but also the supervisors’ or management’ support can improve the productivity and efficiency of employees. It’s very important to have smooth and free communication between all levels of management to ensure support for the creative endeavors of employees at every level. If you never ask, the answer will be no. Communication, thus, plays a vital role. Ask questions on what doubts, problems or issues, big or small, customers have to face. Talk to suppliers and production team, on any cost-effective and quality-improvement idea you have, that can prove viable. Chat with people in and out of the organization to know their viewpoints and opportunities that can be seen by them and not you. It’s essential to ask others rather than making your own conclusions in a situation. Creativity comes from within. Therefore, if you can’t trust yourself, you will never be able to generate creative work ideas. Believing in you is most crucial. To make creative work plan, you need to lose the fear of being wrong first of all. Don’t be afraid to make mistakes or goof up. Even the best of creative people in the world made mistakes and ended up with wonders. Take inspiration from these highly creative people with truly strange and extraordinary habits and accept your peculiarity to inspire creativity in you. The organizations have a pivotal role to play in this process as well. If the organization structure is rigid and communication is closed and hierarchical, the employees will not be able to open up and give out their best ideas. The organizations need to be lenient and open so that the creative work ideas does not remain just an idea, rather a real plan to serve customers with new and improvised products and services. Create some room for unconscious thought, and allow yourself to let go of consciously thinking about an issue or a problem you’re trying to solve. A great way to do this is to block you from that very situation for the time being. Your brain needs time off from all the chaos that’s going on. Creativity comes out best when you are not thinking. It’s just a pop-up of an idea out of nowhere. Thinking is good. Over-thinking can end things before they even get a chance to come out in the real world. Over-thinking not only ruins you and the situation but also twists and worsens everything around than it actually is. Therefore, it leads to less productivity, inefficiency and no creativity because the mind is in a state of confusion, negativity, and mess. – Avoiding crowds, not just standing out of the crowd. – Playing random word games, like finding a new word and guessing its meaning, or playing Remember the names, etc. – Re-connecting with your childhood creative activities, like coloring, reading comics, etc. – Visualising the final result of creative work ideas. These activities help your creative work ideas and not losing on your creative at work and imaginative side. The ideas can be weird or strange; however, it should not stop you from doing the above activities. Begin again. Remember not to carry the baggage of the previous project to the new one, instead of starting afresh will trigger new insightful ideas, leading to surprising results. The more you try, and the more focused you are, the simpler it will become for you to get the most out of your creativity. However, the irony is that most of the great work we do depends on the insightfulness and creativity that come when we’re not focusing on a particular task or resolving an issue. The employees are the most valuable assets for any organizations. It is their ideas and insights that keep the organization running in the cut-throat competitive world. Therefore, providing a positive and healthy environment is a key. 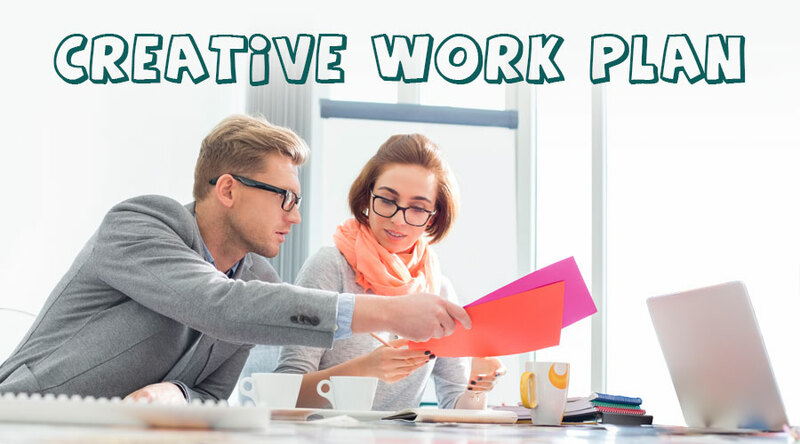 The employees can follow ways to make more creative work ideas and imaginative, thereby contributing their best to the organization. This has been a guide to make more creative work plan, the brain should be given an opportunity for its unconscious thought-process and get a good sleep at night. These are the following external link related to creative work plan.